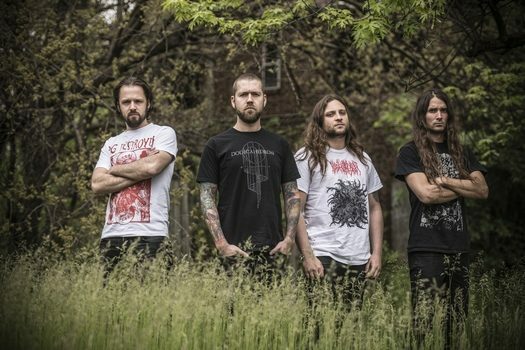 Straddling the lines of death/thrash with a progressive and technical prowess, Revocation have asserted themselves as one of the reliable leaders in the extreme metal field thanks to a consistently satisfying discography and equally engaging live performances. In a field where most attempt to outmaneuver through intricacies, these gentlemen have always been cognizant of the need for the almighty hook – even daring to venture into occasional clean vocal pastures for parts of their last studio outing Great Is Our Sin. On the band’s latest studio offering The Outer Ones, they’ve dug deep into their death metal influences from the past, put in a progressive slant on the proceedings, and yet kept the vocals vicious without a trace of ‘good cop’ cleanliness in the mix. Reaching out to guitarist/vocalist David Davidson once again, we had a pleasant chat regarding the refinement and direction of the new album, his love of horror movies that infiltrates their current video clip, lots of touring talk, and healthy discussion regarding the challenges of modern studio technology versus social media advances to make an impact on an overcrowded music scene. 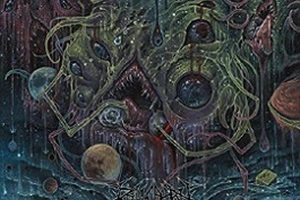 Dead Rhetoric: The Outer Ones showcases a more progressive death side to Revocation than ever before. You knew you wanted to go in more of this direction, would you say it’s a combination of the previous touring cycle and bands you perform with plus your creative desires that fuel where you take the band in terms of songwriting record to record? David Davidson: Yeah, I think you hit the nail on the head right there. It’s that internal drive that’s within us to push ourselves with each record to do different things. It’s also a byproduct of all the awesome death metal bands that we grew up listening to, and touring with them and being inspired on the road. Dead Rhetoric: Sometimes the contrasts appear bolder than ever before, such as the simpler drum tempo during the lead break for opener “Of Unworldly Origin” or the spacious nature of the instrumental “Ex Nihilo”. How much retooling /reshaping goes into cuts like these from their formative stages until the final outcome? Davidson: This record in particular had the most revisions that we’ve ever done. It’s sort of a product of putting out… this is our seventh record, we try to bring new ideas to the table and make sure that you are not repeating yourselves so that you are putting out an artistic statement that feels fresh. This one had the most revisions, there were quite a lot. That section that you are mentioning within “Of Unworldly Origin”, that was an entirely different section than when I started writing the song. I scrapped it, I didn’t even save the riff for future use. It cleaned house of all my ideas- if it didn’t make the cut, I put something more worthwhile into it. The music really benefited from that extra added level of critique and analysis. Dead Rhetoric: Are there times where you choose to dial back certain sections of songs so you don’t become overly technical and progressive? Davidson: I think it’s about finding a balance. Referencing the section you brought up before, originally that was a weird, technical thing in 7/8, it went into this odd time meter thing. I looked at what should be happening, and I was feeling something more anthemic, more headbangable, especially because the music of that song is so technical up until that point- and the solo section is very technical as well for the actual solo. I needed to let the song breathe a bit, because you are working with technicality, and you want to use it as a color rather than a be all, end all. You want there to be contrast, if you let the music breathe a bit in certain sections those technical parts hit that much harder and become much more ear catching rather than everything constantly being on ten and it could be overlooked. The listener can be bombarded with notes, and you want the listener to find the nuances within. Dead Rhetoric: I also noticed that there seems to be more of a traditional, heavy back bone on certain hooks for this album. Is this a fair assessment even as things are progressive and death-oriented? Davidson: For me, it can have an epic quality to be something and still be fast. I was listening to “Unholy Cult” by Immolation yesterday on my way from a concert, and that song has a lot of weird technical, jagged and jarring parts with blast beats, but they have these anthemic parts that have this epic quality to them. If you look at our entire career, we’ve brought those elements in. Whether it was on Existence Is Futile, Chaos of Forms, or Deathless– we always try to bring a kind of anthemic quality to sections to open it up a bit. I am a fan of those parts, maybe it’s the Alice in Chains fan in me. Those big choruses they would go into, they would sound huge- so if I can emulate that on guitar in a certain section, but add more of a prog element to it, I’d really like to mess around with that. It gives the listener a different perspective on what encompasses our sound. I don’t want someone to listen to our music and have it be predictable, or what comes next. Playing with those different textures and tempos, things like that I think is what sets us apart. Dead Rhetoric: You immersed yourself in terms of the lyrical content with horror/sci-fi writing, especially the work of H.P. Lovecraft. 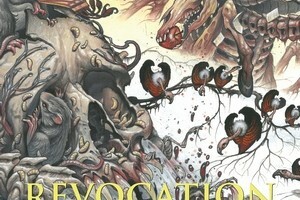 Can you discuss what captures your attention in these genres for writing, and how it works seamlessly with the style of extreme metal Revocation is a part of? Davidson: I think it’s going back to a love of horror as a kid. I remember going to Blockbuster as a kid, and always this would be the section of the store I would go to. I’d beg my mom to rent me horror movies- there would always be something about the covers, like Nightmare on Elm Street. If it looked like it was going to be gory or horrifying, it would be right up my alley. My mom would rent the movie for me, and I’d probably have nightmares, but I would go back to the store and rent another one. It would be sort of like an addiction – some people really like horror and get it or they don’t. To quote Lovecraft, he said the oldest and strongest emotion of mankind is fear- and the strongest type of fear is the fear of the unknown. It’s something that resonates with all of us, and is great fodder for metal lyrics to have an element of escapism there. On the last record we dealt with more of the historical themes of man throughout the ages. Metal has a societal, critique element to it – metal bands enjoy shining a light on those things that are the underbelly of society in sort of a protest of certain things. There’s also an element of escapism- when you look at power metal, death metal, or black metal, there are topics that are bigger than human experience and go beyond into the realm of sci-fi and fantasy. I needed a palate cleanser for myself as a lyricist – I wanted to take it into another direction purposely and go for the escapist route of fantasy, the unknown. Dead Rhetoric: Speaking of escapism, did you enjoy the acting spot that you did in your latest video for “Of Unworldly Origin”? Davidson: (laughs). It was a lot of fun- and it wasn’t our initial intention to have me act in it. I had the idea and concept for the video – and sent it to David Brodsky. It will be a performance video and there will be this other story there. We want to have fun with it, and have it be shot to make it look more VHS tape-like. Like Evil Dead, horror but with a little bit of a campy element to it. I love the truly terrifying horror movies but it’s also fun to watch the Evil Dead series, or Nightmare on Elm Street where there is a tongue in cheek thing. You are almost routing for Freddy Krueger by like the third film because he is such an iconic character with these funny one-liners. I just assumed they were going to hire actors, so we just shot it in a way that would be VHS quality. So David circled back and said instead of hiring someone else to play the Witch Hunter, why don’t you do it since you have the idea fleshed out in your mind. I wasn’t thinking about it, but I decided to try playing a colonial witch hunter. I played an 80-year-old man in our “The Grip Tightens” video so I figured I would have to sit through way less make up. It was fun, I enjoyed it- we had a lot of laughs. Dead Rhetoric: For the last album, you did numerous opening slot runs with The Black Dahlia Murder and Cattle Decapitation, plus the Summer Slaughter tour – forgoing any significant headlining action. What factors come into play for building and sustaining a healthy following for Revocation – does the quality of the audience matter more necessarily over quantity, as well as diverse packages for more new faces to discover the group? Davidson: You have to approach things from all angles. Like you said, we didn’t really headline too much on the last cycle, so for this album we have to come out, all guns blazing with a headliner for this album cycle. We had so many great support slots, we could have booked one last headline tour for the Great Is Our Sin tour cycle, but I felt like we might as well sort of save that so that when the new record comes out, there’s a buzz around it and it feels that much more special. I think you have to approach it from all angles. There are some bands that are just so big, that opening for anyone isn’t viable – I think that we are big enough that we are a headliner within our scene, but at the same time if a great opportunity comes along where it’s a package with our buddies or we can reach a different group of fans, we weigh the options. You can’t be too proud to go out and open for other people, we look at it from a business standpoint. If we do this (tour), we know our fans will come, but if we do that (tour), we might be reaching more new fans or a different type of audience. If we can win over half the crowd, that would be awesome. The new people that are seeing us, if we can win over 30-40 % of them, that’s a good chunk of people to gain every night. It’s the same thing when it comes to festivals. You go out and play Wacken where there are close to 100,000 people, not everyone is there for Revocation – but you are playing in front of a big crowd of people and probably 70% of them have no idea of who you are. You can win some people over that way. Dead Rhetoric: Have you ever been surprised on tour as far as the age or background demographics for audience members that are into Revocation? Do you feel that the variety and musicianship allow for a diverse audience, even if there are times where you are getting across very heady ideas? Davidson: Yeah, I am surprised sometimes. You can probably venture that our audience is going to have a lot of males in the crowd, because death and extreme genres are such a testosterone-driven thing – but I’m seeing more and more women in the audience which is cool. I’m seeing things like a father and son somewhere in Canada, and normally it’s like the dad dropping off the kid but in this case the dad was obviously older but both loved the band. It was cool to see the family coming together to see Revocation. People of different, diverse backgrounds – I love seeing that. It’s great when I look into the crowd and I see a diverse mix- everyone is welcome at a Revocation show, whatever race, creed, color, and gender. If people are there to have a good time and enjoy the music, that’s all I care about at the end of the day. It’s more rewarding the more diverse the audience is- I get a good feeling, our music is able to reach a bunch of different people, that’s so awesome to be able to transcend everything. Dead Rhetoric: You’ve been on Metal Blade for a few albums now – do you see major differences in their staffing and outlook for Revocation compared to your time on Relapse? Davidson: I think both labels are very passionate about the band. I guess Metal Blade has more of a wider reach worldwide, but I’m still close with some of the folks from Relapse- I’ve bonded with them. It’s nice to still hang out with different people even if you aren’t on the label anymore. We’ve been lucky that every team and label that we’ve worked with has been into the band, at the end of the day you are running a business and you have to go with the right decision for the band. Metal Blade has more staff, but times are changing across the board. I feel like every label is going to be downsizing at a certain point just because of the way the industry is going at this point.